Carol Loar on 19 November 2013 - no cast!! Ron on 19 November 2013 - no cast!! normofthenorth on 19 November 2013 - no cast!! thelifechangingpop on 19 November 2013 - no cast!! Firstly, my thanks to all of you for you kind wishes and support, it has been a great help as I have got through the recent difficult days. I went in to a different hospital around 1.30 on Monday and was being operated on by a different surgeon by 3:30. I had a little bit of time to control / manage my anxiety about hospitals and in particular general anaesthetic. The only blip was when I did not get released on the same day. The operation took around an hour, 30 minutes longer than scheduled, however I am lead to believe it went well, fingers crossed. I am am home now staring at the equinus cast again. It’s more painful this time, maybe because I am avoiding tramodol…. Anyway taking it easy for the next few days…. I hope you are all getting on well!! Hang in there spacemonkey; glad to hear the second surgery seems to have gone well. Here’s hoping the second recovery is a real recovery! Thinking of you spacemonkey and trying to send healing vibes! Hey Space Monkey! Glad to hear the update. Sorry that you are in a cast again. Best wishes for a speedy recovery! Tomorrow I go to neutral…….Doc says weight bearing with crutches should begin……I am so nervous after hearing what SM went through. Tomorrow I go to neutral, 8 weeks post op for RAT surgery…..I am so nervous after hearing SM story. Dr wants me to start weight bearing with the help of crutches for two weeks then start PT. Anyone knows how long it takes for the AT to completely fuse after surgery? No graft was used. My Dr. said 12-16 wks……..can anyone confirm ? BB, I’m not sure I’ve ever seen anybody track that “completely fused” point after an ATR, with or without surgery. Rather, there are a bunch of steps going from (usually) being a total bed-ridden invalid (especially for the surgical patients), then crutch-bound NWB, then PWB, the FWB, then in 2 shoes, gradually walking more normally and regaining strength and flexibility, then running, then jumping and playing high-ATR-risk sports (again). For most of us, there’s also a long slow progression from having occasional brief moments when we forget about our ATR, to having longer and longer periods when we don’t think about it. Click on bit.ly/UWOProtocol for one good rehab schedule. One of the themes of this site is that recovery is a year-long marathon, and that’s a reasonable average. But there are lots of heart-warming milestones much earlier than that. E.g., I went for a week-long downhill ski trip at Whistler in Week 17, non-op, and others have matched or bettered that. I was back at competitive court volleyball (the activity that ruptured BOTH of my ATs, 8 years apart) after about 10 months, and several people here have beaten that time soundly. Personally, I think treating ATR recovery as if it’s a simple marathon, with only one finish line, is a recipe for frustration or depression or boredom. Very soon after treatment begins, progress is made, things start getting better. If you appreciate that progress, the whole journey can be fulfilling and pleasant. 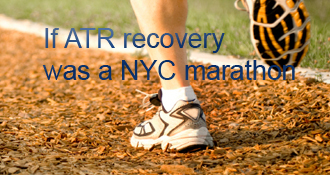 John Lennon once wrote “Life is what happens to you while you’re busy making other plans.” ATR Rehab isn’t just something to do while you wait for your life to begin again, it’s part of how you’ll be spending the next part of your life, so you might as well enjoy it and make the most of it. Thanks for the encouragement and for showing me the silver lining. I am ready for that marathon. My injury occurred while playing competitive B- ball……I came out of retirement to play in a tournament. During the 4 th game it happened when I was making a simple, non forceful dribble to my left. I have no intention of playing again but I do miss my gym workouts and my 3 days/ week of urunning. Where do I get that Rehab workout schedule ? BB I was advised that re-ruptures beyond 12 weeks are very rare, but it often takes up to a year for the tendon to fully recover to allow you to return to sport. It can take this long to regain your confidence too. My tendon did not heal properly, at 10 weeks post op it was only being held together by the sutures. It was a late presentation therefore probably under too much strain on the initial repair…. all of this is speculation of course. What I am trying to say is at 8 weeks your tendon should be pretty strong and benefit from controlled mobilisation. My second repair used a ‘turn-down’ technique to bridge the gap between the ’stumps’ of tendon to make sure there is a join between healthy tendon and not the frayed ends. I still expect to make a full recovery, but have been advised it may be 18 months before I can consider the tendon fully healed and return to sport. I was weight bearing in the boot after 6 weeks and the additional mobility was great. With regards to a workout schedule I would ask your PT for one. A lot of the work at 8 weeks will still be around how you safely build up all the other muscles that will have wasted by not being weight bearing, so let the PT know how much time / effort you can commit and they should advise you accordingly. You have my best wishes the next stage of your rehab goes well, I look forward to reading about the positive outcome. BB, it’s at bit.ly/UWOProtocol . Copy and paste that into your browser, and there it will be. Wow, thanks for the response guys. SM you are in my prayers buddy, hope ou have a full recovery this time. Thanks normo will def check it out. BTW…..boot goes to neutral today……..PWB…….VERY Partial……heeding SM situation. I live in the Caribbean……Trinidad…..have to head up to Fl in two weeks to check in with my surgeon. Guess he will give me my PT rehab routine to instruct my therapist in Trinidad. Best of luck BB, I hope you can enjoy the sunshine? It is 6 degrees and damp here in Scotland, but we are still smiling! I am looking for a new coat, that will fit in my elbow crutches do you have to check with the airline before flying to Florida in an aircast? They would not allow me to fly to Orkney ( about 1 hr 20 m ) in my equinus cast. Would be good to hear how you get on. Take care, my best wishes for a continued Great recovery!! Hey SM, I am wearing a ‘Cam Walker’ boot not an air cast. It has a compass on either side that adjust the degree setting. It fits well and really holds the leg at the precise angle. Have no problem getting on an aircraft with it. What is an headache is security . I hate those elbow crutches. I had a set in Fl but tossed them. They locked onto my elbow once when I lost my balance and almost caused me to break my leg. With my normal crutches I could just let go and break my fall by doing a judo roll or with my hands but those elbow crutches are attached and not so easy to release. Has anyone ever used ‘King Brand’ BFST ( Blood Flow Stimulation Therapy ) wraps or braces ? I have done some research on them and the response seems very positive. Seems like the product reduces the healing time. I was considering the purchase of one but would like a first hand testimonial if possible……..we all know that those products can fake ‘Reviews’ on their websites. LOL……just looked at the ‘Anti- Spam’ word I had to type ‘quicker’……..
Two shoes stage has arrived. Therapy is also a rude awakening…….walking is tough but I am trying. Congrats on the two shoes! No heel lift in your good shoe? Does this mean you’re lopsided? That’s a good way to cause back and hip problems, so be careful! Hang in there and I hope that AT moves soon. 2 shoes is great! Be careful with the weather - I’m in Chicago, and the freeze is coming (still can’t believe we had that many tornadoes this past weekend - unprecedented). unable to get the AT to move confuses me some. Can’t you extend your ankle? Doesn’t your wasted calf muscle show signs of motion when you do? Can’t happen without the AT moving. I didn’t use heel wedges in shoes (though I did spend time in a hinged boot, pre-shoes), but I would THINK that you’d walk straighter with wedges in BOTH shoes instead of just the one. Comments from shoe-wedge people? I’ve just read your story, crikey you haven’t had it easy. Hope that tendon has healed, must have been hugely frustrating to not have got an absolute diagnosis of healing from the ultrasound. I guess you’ll have to find some more patience and wait for your PT to give you the go ahead to start hinging your ankle. I assume that you are using crutches to get around. Be careful of the frost! Hope all is positive from here onwards. Keep us posted. Gary, once my boot hit neutral after 8 weeks I started driving. Neutral is a good thing. LOL about the winter comment b/c I tore my Achilles in early August, so that was a boomer. Is six months from surgery generally a reasonable expectation to drive? What Stuart said. People here did all kinds of different things with driving post-ATR on the right leg. Some governments and some insurers restrict driving in a boot, some don’t. Doctors’ advice seems all over the block, too. Some patients here learned to drive left-footed. When I went into 2 shoes (after doing some driving in a boot), I learned to hit the brake pedal with my heel, so I could stomp on it as hard as I wanted without putting any strain on my calf and AT. Gary - It is best to get a clearance from you doctor before you drive. This will cover your insurance and other action should something go wrong. Modern cars do not need a great deal of pressure on the pedal to stop but in an emergency you tend to overdo the pressure and that could cause a re-rupture. It is impossible to control what others do on the road but you can take precautions such as leave a greater than normal gap between you and the car in front (3+ seconds) and drive a little slower. Appreciate any input on when it was safe to drive for right footed injuries? Thanks. Gary, all the old studies of “conservative casting” — traditional slow non-op ATR treatment, mostly for geezers and sick people — produced thos high rerupture rates. A good 2005 meta-study of all the older good studies found an average around 12%, IIRC. I reported it and linked it on my “Studies” page. Since 2007, smart people have figured out how much better they can do with much faster non-op rehab. No comparison! The results, going fast, are good enough that some elite athletes are starting — though just starting — to skip surgery and go fast, pain-free, low complications, scar-free. Under what circumstance is 15-20% rerupture rates common? Best practice for 1 crutch is clearly opposite the injury. For a cane, I think it can go either way, and I think I went on the injured side. Mind you I hated them both, and ditched them ASAP. Reruptures are a sad fact of life post-ATR, but the risks can be minimized down to near-zero levels. Post-op rates are usually 8wks, NWB >2wks — cf. bit.ly/UWOProtocol ), rerupture rates of 15-20% are common. NB that the Worst Care still avoids rerupture in 80-85% of ATRs (which is probably why it’s not extinct yet) — good news and bad. SM’s experience is quite rare IMExperience. There’s probably a cause, but we may never know it completely. Matching the amount of surgical shortening (if any) to the immobilization angle is clearly more art than science, but the data suggests that most legs adapt within a pretty wide range. SM’s didn’t. I understand. I was thinking about the wedge being moved and all the walking afterwards that may have caused it. Thanks the the answer, and good luck. Hey SpaceMonkey….. Sounds like you have a great attitude. I have thought of you often. I am 11 weeks post op, and if my re-rupture happened now or last week, I could not have handled it like you have. You and I both re-ruptured while in a boot. Although yours wasn’t because of the boot, like mine was. I did get a vacocast the second time around and thought it was the best investment i’ve made. My second time around, I was in a cast for 6 weeks then in the boot for 5 weeks, and although initially I was bummed about it, I think it was the best. In fact, I went to two shoes a few days ago. Hi SM, sorry to read about the re-repture. Keep up the good spirits and looking forward to reading more about your progress! Spacemonkey: This is the type of story that keeps me up at night. I’m approaching my four-week post surgery mark in a few days and hope to start PT next week. Sufficed to say, I am terrified of a re-rupture. A friend of mine re-ruptured when he pushed too hard in physical therapy and that is a concern of mine. Best wishes for your recovery!! Wow, I was told by my Ortho that it was not possible to re-rupture while in a boot - guess he was wrong. You were just walking, too. That is scary. I am just over 4 weeks Post Op and will be a bit more careful going forward. Thanks for the post and heads up. Good luck with this go around and I hope you heal quickly with no further set backs. So sorry to hear about you re-rupture. What were you doing when it happened? I wish you a quick recovery. Second rupture was on the same leg, 10 weeks post surgery. The explanation I was given was….. The tendon was possibly repaired under too much tension first time round preventing it from healing as expected. What is too much tension is down to the opinion of the surgeon at the time. The second surgeon repaired it using a ‘turn down’ technique, (http://www.uwhealth.org/files/uwhealth/docs/sportsmed/SM-27399_AchillesTendonProtocol.pdf ) leaving the tendon under less strain. Th re-rupture happened as I was walking down my hall! wearing the ‘boot’, the sutures gave way…. As the tendon had not healed it was only a matter of time. I sincerely hope this does not happen to anyone else! Thanks for the question and good luck with your recovery! Good luck! I’m wondering: second rupture on same side? If so, how long since first and what caused it? I’m sending you every best wish I have. Best of luck on Monday, spacemonkey. I’ll be thinking about you. Good luck on Monday. I can’t imagine how depressing it must be. But time will pass and hopefully it will just be a distant bad nightmare. Good luck on Monday. You will do great. Please reach out if you need a cheerleader!!!! Thanks superjewgrl, your wishes and sentiments are very much appreciated… as is everyone’s support… I have been spending a couple of days considering my options (and generally feeling sorry for myself). However time to move on and I have booked myself in for surgery on Monday. Different Surgeon, Different Hospital and hopefully a Successful outcome…..
Spacemonkey’s AchillesBlog is proudly powered by WordPress and WPDesigner..